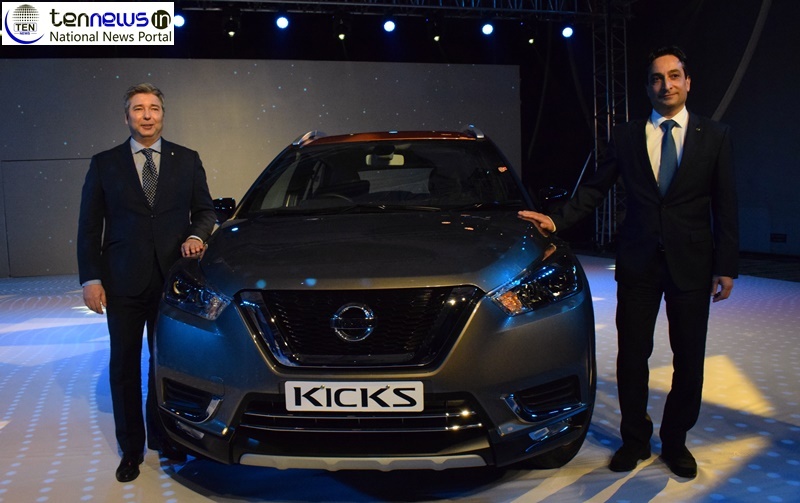 Nissan Kicks SUV launched in India, Price starts from 9.55 lakh onwards! New Delhi : Nissan today launched its much-awaited Intelligent SUV, the new Nissan KICKS in India, With best-in-class features drive innovation and comfort the new Nissan KICKS is available at an introductory price of INR 9,55,000 lakh across India. Deliveries to customers will commence today at ail Nissan dealerships. “The new Nissan KICKS has generated a great amount of curiosity and excitement among customers. It is a complete vehicle package with an exceptional combination of intelligent technology, class-leading premium-ness. The stylish design is complemented by enhanced performance and driving dynamics. The new Nissan KICKS will offer a 1.5H 4K petrol option driven by five-speed manual transmission and 1.5K 9K dci Diesel engine driven by six-speed manual transmission. The fuel efficiency certified under test conditions is 14.23 km/I (Petrol) and 20.45 km/I (Diesel) as per ARAI Certification. Nissan Kicks SUV launched in IndiaPrice starts from 9.55 lakh onwards!